This painting is most likely an oil study for Trego’s 1886 work, The Battle of Fair Oaks, Sumner’s Reinforcements, May 31–June 1, 1863. Several of the soldiers and their poses are identical to those in the Fair Oaks painting. While some parts appear unfinished, other passages are rendered in detail. However, the painting is dated 1895, both front and back. The artist gave the painting to Dr. Frank Swartzlander Sr., who was a friend of the Trego family going back to their days of residence in Yardley, Pennsylvania, in 1895. It is possible that Trego revisited the earlier study and made further additions before giving it to Swartzlander. 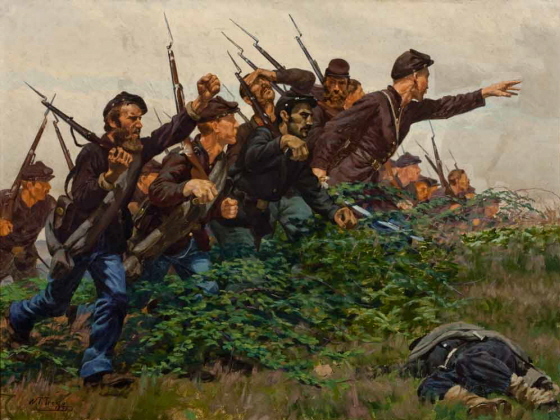 If he painted it from scratch in 1895, it would be the only instance known where Trego recycled part of a previously successful Civil War work. The artist gave the painting to Dr. Frank Swartzlander Sr. of Doylestown, Pennsylvania. It was inherited by Dr. Frank Swartzlander Jr., who passed it on to his daughters, Ellen and Mary Swartzlander, who in turn sold it to J. D. Miller. As “Civil War Scene,” in Helen Hartman Gemmill, “The Artist with the Paralyzed Hands,” Antiques (November 1983), p. 997. The painting has been cleaned and conserved and is in excellent condition.